So this is just a quick update to let you all know what I’ve been working on recently. Improvements to team games. I’ve fixed the glitches we found recently and disabled friendly fire for team games. I’ve also added a team chat feature (send chat messages only to your team mates) and allowed more than two teams in a game. A familiar gnome book room... or is it? Knights will spawn at a random entry point (i.e. it’s a different point each time you respawn; knights don’t have a fixed “base” location in this game type). You get one point for a kill, and lose one point for a suicide (e.g. falling down a hole or zombifying yourself). There is a time limit and the player with the highest number of points when the time runs out is the winner. I also wanted to have a go at implementing Loki’s suggested ogre quest (see previous post). 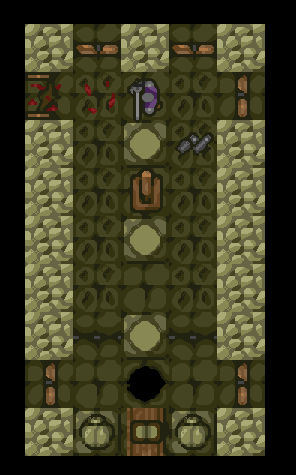 This means importing the ogre graphics into the game, defining how the ogre behaves and designing a room layout for the ogre’s lair. The plan currently is to release this either later in December, or early January. Wow, can hardly wait to see these updates, they all sound very cool. Brilliant idea about rotating rooms, that will truly take randomized dungeon effect to a whole new level of surprise.